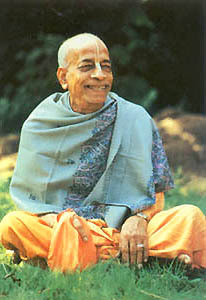 A.C. Bhaktivedanta Swami Prabhupada who is a true champion. Most respected guru maharaja, unto you I surrender my life. Which, for many births, I protected dearly as a wife. Chewing the chewed, I had become victim of maya's dance. And in my imagination, like thousands of suns, it is glittering. This is because of the lustre of Lord Krsna's hue. Please keep me near you, for with my own eyes I need to see Him shining. And this is what makes you my only true father. That refreshes the dried out souls erring hither and thither. Only the Lord can know you verily. The significance of your words truly. Birth after birth and start afresh.